ZBrush is a digital moulding, texturing and painting platform that has transformed the 3D industry with its influential features and its unprompted workflows. It is built in a very sophisticated interface and offers the most unconventional tools for the upcoming digital artists nowadays. With a set of intense features that have been developed keeping its functionality in mind, ZBrush creates a user experience that feels exceptionally normal while concurrently motivating the artist deeply. ZBrush has the ability to sculpt upto a billion polygons but allows you to create limited only by your imagination. Zbrush is used for creating extraordinary resolution models in games, movies and animations by most of the companies in this business. ZBrush provides you with all the tools used to quickly sketch a 2D or 3D concept and then take that idea to its completion stage. ZBrush enables you to create accurate renders directly with the help of lighting and distinctive effects. ZBrush is extremely helpful in reducing costs since it enables you to sculpt with millions of polygons without the need of purchasing expensive graphic cards. ZBrush is being widely used by most of the art enthusiast and all the famous film and game studios. Game designers and animators make the maximum use of ZBrush in their current productions as it is extremely useful in the entire game designing process from concept design to package design and marketing promotions. The ZBrush certification course by Brainmeasures offers a great opportunity to almost all the animators, game developers, game designers and artists. This course explains all the major aspects of the course and its applications in detail. ZBrush combines the expressions and benefits of practical paint and clay with the speed and advantages of an automated medium. ZBrush enables producing digital creations with an unmatched complexity, detail, resolution, eminence and magnitude. ZBrush is extremely supportive in modelling, texturing, painting and designing, and this is the reason it is the maximum in demand these days. Brainmeasures is an ISO certified company renowned for their world class teaching standards and skill testing. After getting enrolled in this course, you would receive an E-book that would guide you for the exam. Upon successful completion of the exam, you would be awarded the certificate by Brainmeasures. The average salary of a 3D Character Artist ZBrush is $50,214 -$67,116 approximately. Salaries vary depending upon personal experience and qualifications of an individual. Introduces you to the ZBrush program. Discusses about buying and selling interface layout. Explains the Basics and working with 3D ZTools. Discusses about modeling a head. Explains about brushes, materials and painting. Discusses about the Dragon’s head. How to create wings with shadowbox and ZSketch. Discusses about making the Dragon’s body. Explains about UVs and Masking. Explains about painting the Dragon. How to create the collar by using Insert Mesh. How to recolour the model. How to make a fire hydrant. Discusses about the Base stand and Grass. Explains about combining it all, loading and merging. Explains about posing the Dragon. Explains about polishing the model. Explains about the lighting and rendering setup. 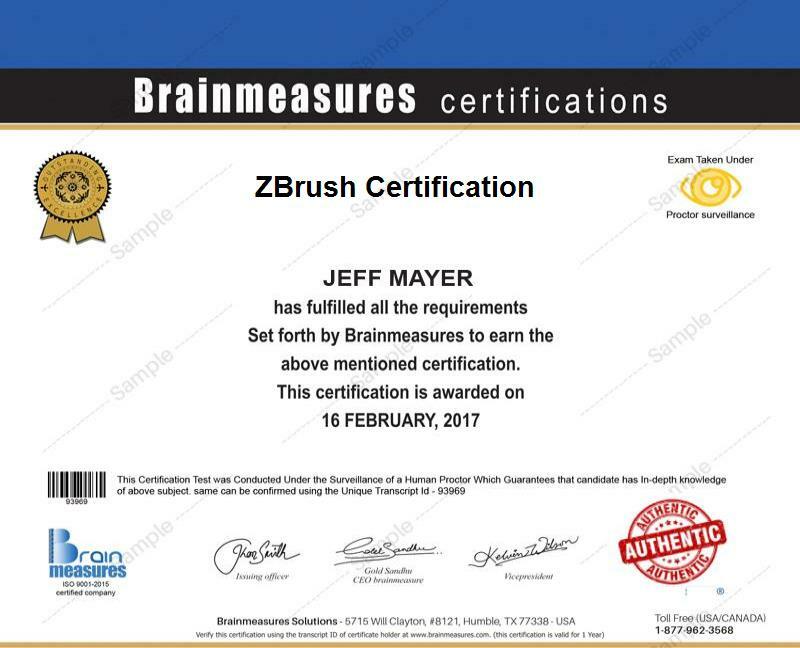 Individuals working in the animation, films, game designing and movie industry would be greatly benefitted by the ZBrush certification course by Brainmeasures. Certifications by Brainmeasures are accepted and recognized worldwide and are of a very high value. ZBrush is the maximum demanded program nowadays especially by all the game designing firms. The ZBrush program has revolutionized the 3D industry with its modern and smart features. It has brought a drastic change in the quality of work and has quickened the entire procedure which was so time consuming earlier. ZBrush certification course is definitely the best choice for all the animators, game designers, developers and artists.